Removal from UK to Spain is something that many British people dream of doing. It is important, however, to ensure that all the correct procedures are followed and carried out if you intend to become a Spanish resident. What do you need to do? What happens if you don�t? To apply for what is known as �residencia� after your initial removals to Spain has happened, you will need to consider how long you intend to stay in the country. If your intention is to spend three or more months there each year, you will need to apply for a Residence Certificate. This means registering at the Central Register for Foreign Nationals � often found at the local police station. You will need to give your full name, your NIE number (if you don�t have one you will be issued with one at this time), proof of identity such as a passport, and a signed EX18 form. 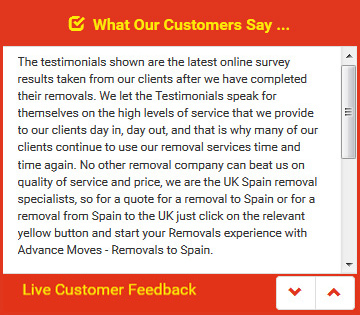 You should register within three months after your removals to Spain from UK has occurred. Due to Spain�s economic problems lately, you must also be able to provide evidence of your financial status, and prove that you are fully covered by health insurance. Once you are legally a resident of Spain (not a citizen, this is something different and requires a lot more time and paperwork), your rights will also extend to immediate family members including your spouse or civil partner, children (grown or under 21), and parents. The more ex-pats register, the more money the area of Spain they have chosen will receive, which is good for everyone. Removal from UK to Spain take a lot of time to prepare for, but using Advance Moves means the worry is taken out of the move itself. We offer excellent service with personal experience in moving to Spain. See our website at http://www.advancemoves.com/ and contact us (on 0871 218 0612 or info@advancemoves.com) for a quote.